This is a very important group at The Carolina Strut! 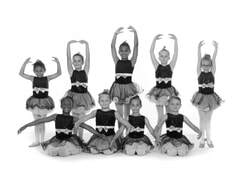 These dancers represent the studio all over Carteret, Craven and other counties. The Shooting Stars Performance Team performs at local events such as the NC Seafood Festival, National Night Out, Newport Pig Cooking Contest, Havelock Chili Festival and many other events. This group also performs on televised events such as the Cystic Fibrosis Telethon. The Shooting Stars Performance Team is coached by Ms. Jodi Justice who is also head of our early education department.